Asteroid Precision was founded in 1966 and has been providing industry-leading precision grinding services to the aerospace, medical, defense, automotive, and hydraulic industries ever since. Over those 50-plus years, we have gained a reputation as the premier cylindrical grinding company in Illinois and across the Midwest. 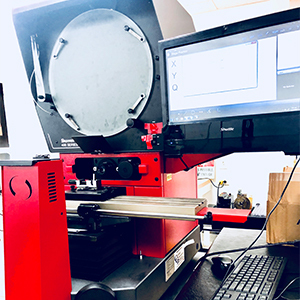 Our use of advanced and ongoing training for our Operators, as well as our use of the latest and most advanced precision grinding technology, has allowed us to remain at the forefront of providing our clients with consistently reliable results and accurately ground OEM components. If you have a cylindrical grinding project that requires strict attention to detail and a team committed to excellence, then you should contact Asteroid Precision today. Cylindrical grinding is an important process used to achieve a finished grind on both the outside and inside of a workpiece. In addition to creating a high-quality finish with incredible accuracy, CNC cylindrical grinding also has the added benefit of allowing for high-volume production and the grinding of complex curved surfaces. Cylindrical grinding is typically achieved by traversing the grinder along the surface of the work object, but it can also be used to create plunge cuts for narrower features on a given component. When cylindrical grinding is chosen as the method for an internal grind, the workpiece can be held in a chuck. Besides being a versatile and highly accurate form of precision grinding, cylindrical grinding can also be applied to components that have already been hardened or have received an application of hard coating. The types of components that cylindrical grinding is typically chosen for include hydraulic cylinder shafts, retainer pins, transmission shafts, and other hardened components. At Asteroid Precision, we fully understand that when it comes to making a choice about which precision grinding company is right for your project, we are not the only option out there. However, we also feel confident that if you choose to work with our experienced, execution-oriented team, you will return to us for all your future jobs. We stand by our record of success and non-negotiable standard of doing the best possible work when it comes to your cylindrical grinding project. Few precision-grinding companies around can boast the same level of experience that over 50 years in business has given Asteroid Precision. Our refusal to settle for sub-par execution and our commitment to utilizing and training our Machine Operators on the best equipment available is just one of the many things that separate us from the competition. For the best OEM components, ground to exact specifications, created by a deeply dedicated team of experts, look no further than Asteroid Precision in Illinois. To make sure that we are producing the best OEM components for our customers, we also make sure to use the highest quality and job appropriate grinding wheels, lubricants, and coolants with all of our CNC cylindrical grinding machines. Getting the details consistently correct on our component runs is an important part of what we offer — as well as something we take extreme pride in. To help ensure the quality of our finished components for each of our clients, we subject each and every lot run to an unmatched inspection process. From the first article until the final inspection of the entire production lot, we are monitoring our work and looking for any imperfections. To learn more about our cylindrical grinding services or to discuss getting your project started, contact one of our expert team members Asteroid Precision in Illinois today. We look forward to showing you why we are the leading provider of precision CNC cylindrical grinding in the upper Midwest.